The “Eliminator” is one of the first extractors of its kind. The unit features a 1.5 gallon heating tank and a 2 gallon holding tank. 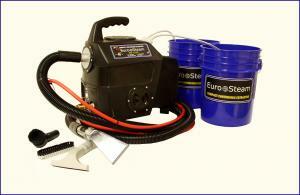 The “Eliminator” heats water to 200F allowing you to deep clean carpets in a professional manner. Once water is heated the enclosed tank will keep temperatures above 190F for over an hour. The heating element will automatically cut off in order to prolong the life of the heating component. The heating element compartment is protected with a safety screen. Draining dirty water is as easy as pulling off hose and dumping in the drain. The Eliminator will clean over 100 sq. ft. at a time and has several optional tools. The Eliminator allows you to clean your house, cars, tile, and concrete floors with ease. Cleaning Path: 3" to 8 "